← Does Your Resume Have A Missing Narrative? In response to this recent blog post, a friend forwarded me a copy of a resume he recently worked up (and, yes, it helped him get a new position!) – I thought it was quite creative and visually appealing, so I’m sharing it with you. Identifying information about specific companies has been greyed out, but underneath the grey boxes are corporate logos. It was a nice touch. My friend used wordle.net to generate the word cloud, and Google docs to create graphs and charts. Nice and simple. 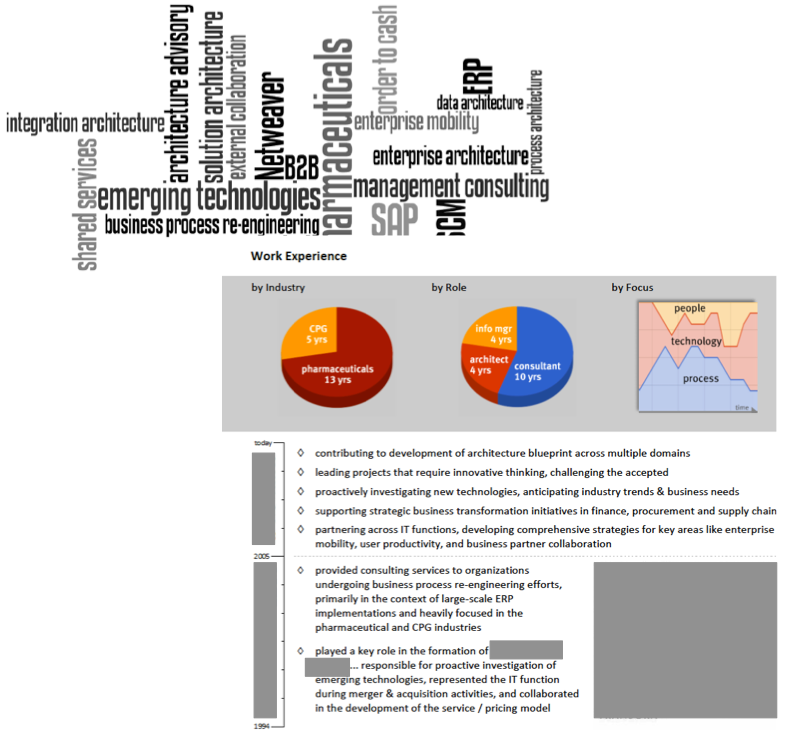 (Page 1 of the resume has a nice pic of the candidate with contact info and the word cloud; page 2 has the other info. I’ve joined the elements into one graphic). So, what do you think of this approach? Would you use it, as a job candidate? Would it get your attention, as a hiring manager? Also – if you’ve seen other examples on-line of creative resumes, please add links to them in the comments! Out-of-the-box brilliant and would appeal especially to reviewers who are visual. I’m definitely going to adopt (read: rip off) this approach, although I don’t use resumes much. Instead I ask people to read my LinkedIn profile. Still, I’m thinking creating a wordle would be fun and cool to post on my website. Wonderful! I have a PowerPoint visual résumé. I presented it at my Toastmasters club and it was a hit. Now I need to record it post it as a multi-media résumé on my website. Thanks, Steve!